يقع فندق Allambi Holiday Apartments، المصمم ليناسب كل الضيوف سواء كانوا من رجال الأعمال أو السياح، في مكان ممتاز في أحد أكثر المناطق تفضيلاً في بحيرة انترانس. يمكن من هنا للضيوف الاستمتاع بسهولة الوصول إلى كل ما تقدمه هذه المدينة النابضة بالحياة. يوفر الفندق بفضل موقعة الجيد وصولاً سهلاً إلى أهم معالم المدينة.
. يعمل Allambi Holiday Apartments على ضمان إقامة مريحة لضيوفه من خلال خدماته الممتازة وحسن ضيافته. يمكن الاستمتاع بمجموعة من الخدمات على أعلى المستويات في الفندق كمثل واي فاي مجاني في جميع الغرف, واي فاي في المناطق العامة, صف السيارات. في Allambi Holiday Apartments غرف نوم يزيد عددها عن 7 صممت بذوق وعناية لتوفر لك كل وسائل الراحة . بعضها يحتوي أضاً على تلفزيون بشاشة مسطحة, اتصال لاسلكي بالإنترنت, اتصال لاسلكي بشبكة الإنترنت (مجاني), غرف لغير المدخنين, مكيف هواء. يقدم الفندق العديد من الفرص للاستجمام كمثل حمام سباحة خارجي, حديقة. إن كنت تتطلع إلى إقامة مريحة وهادئة في منطقة جيبسلاند، فستجد في Allambi Holiday Apartments بيتك الثاني. Owner is very helpful. I will remember and thanks forever that they helped me to change my booking date. Cooking equipment! washing facility! Ironing! entertainment! all have. The apartment was spotlessly clean, and the beds were comfortable. Washing machine and dryer were provided in the apartment which is very helpful as we only bring one week of clothings for our two weeks trip in Australia. It was the cheapest apartment we have stayed throughout our entire trip so it is value for money. Overall we had a good stay. Highly recommended. Very pleasant stay with all amenities provided. Would come back in future! - Friendly staff. - Cozy room - Big bathroom - Free parking - Quite and relax place to stay - Suitable for family with childrens. It was great. I would recommend this room for anyone except people wanting to party in their room. There is a strict no noise policy after 10pm which is perfect for couples and families. Will stay there again on next visit. The stay was comfortable and we could make our own meals with all the kitchen facilities available. The environment was quiet and the rooms were large and with warming facilities so we could have a very good sleep through a cool night. 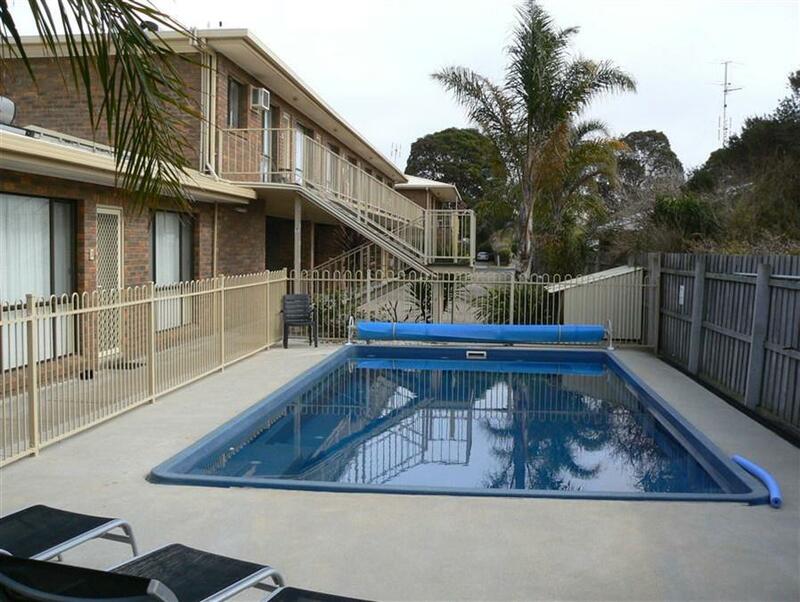 The unit (a two-bedrooms apartment)was clean but at a very reasonable price so it was out of our expectation when we first entered the unit that we could have such a great unit. washing machine and dryer provided which we need that after a week of travelling! Apartment was clean in general with almost complete utility provided. 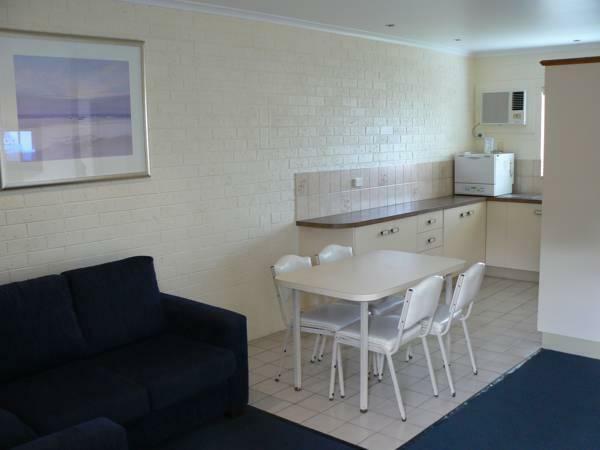 The apartment comes fully equipped with the necessary facilities and is very well maintained. Another plus point is it's location to township, making purchasing of food items very convenient. Slight improvement can be made to the heating element in the room (it doesn't seem to warm the room up). Spacious apartment with all necessary machines. My apartment is located at the 1/F but without lift. Thus it is inconvenient to carry all heavy luggages to the room. 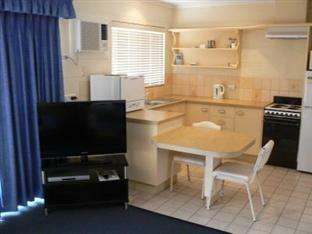 But, the apartment is spacious equipped with washing machine, drying machine and all necessary cooking facilities. the best place i stayed in australia. highly recommended. kitchen has everything including sauces. it also has a bathroom bigger than my hotel room in melbourne. young boy at the reception is very shy and cute. Fully equiped one bedroom apartment..
Great little motel,nice clean swimming pool and 2 min walk from the main street...Fully equiped kitchen with dish washer..Overall very clean apart from stains on bath towels..they were clean but definetly had to be washed with stain remover or something else to get rid of the stains.. I arrived late and the owner was there to give me the keys. Friendly but quiet representative at check out. Good price for the size and amenities. Central location. Pool looked nice, but did not have time to swim.